Decision making by flood risk managers is challenged by uncertainty and changing climate risk profiles that have elements of deep uncertainty. 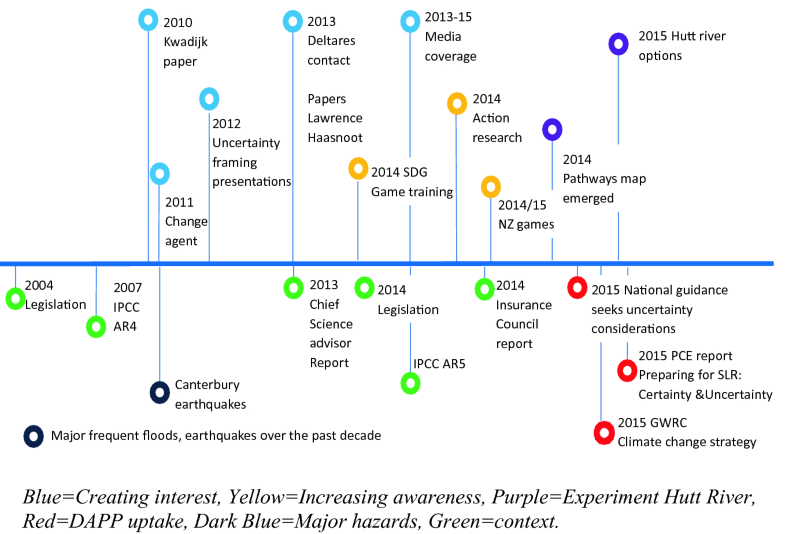 Flood risk managers at a regional level in New Zealand requested better understanding and tools for decision making under conditions of uncertainty and changing conditions. A game was used to catalyze a process of new knowledge transfer and its uptake in technical assessments and decision making processes. The understanding enabled DAPP to be used to develop a long-term plan that can accommodate changes in flood frequency from climate change (as projected in three climate change scenarios) over at least 100 years. Use of “new” economic tools with DAPP facilitated decision making to consider the sensitivity of alternative policies to a range of climate change scenarios, to discount rate, decision review date, and costs and losses, thus addressing deep uncertainty by considering the long-term effects of initial decisions to changing conditions. The risk of path-dependent decisions and the role that current frameworks and practices play in blinding actors to the range of possible outcomes that could evolve in the future, was reduced. A series of interventions to raise and increase awareness through new information and its framing, experimentation, and leadership enabled the uptake of DAPP. Daya Atapattu is deceased (October 2018). The adequacy of the tools typically used by natural resource managers is being questioned in the face of climate change and increasing human exposure to the natural hazards, because of future uncertainties and increasing risk. Large investments have been made worldwide on structural flood protection and for coastal flooding. These are increasingly being found to be inadequate as risk profiles increase with changing climate impacts. This chapter describes how flood risk managers at a regional level in New Zealand applied the Dynamic Adaptive Policy Pathways (DAPP) approach (see Chap. 4) to managing deep uncertainty around flood frequency associated with changing climate, and examines the lessons learned from taking DAPP theory into practice. New Zealand is a country that is geologically young, seismically active, and highly pluvial. It is located in the South Pacific Ocean, where the dynamics of changing climate are readily apparent and have a disproportionate effect on human habitation. For example, flooding is the most frequent natural hazard experienced in New Zealand, with a major damaging flood occurring on average every eight months (Ministry for the Environment 2008). This means that there are long-established institutional arrangements for governing flood risk and civil emergencies arising from floods, and there are professional standards and practices used commonly by flood risk managers. These have however developed under past climate conditions, which makes them less well suited to addressing climate change induced risk, and particularly to deep uncertainty (Lawrence et al. 2013a, b). In the past in New Zealand, flood managers built large structural protection works to manage flood risk in river catchments. Structural protection, such as levees, has been the dominant measure historically used by the regional councils responsible for flood management, largely designed on the (implicit) assumption that the future will be like the past. In the last few decades, flood risk management has also been augmented with statutory planning measures that can accommodate specific flood levels in existing areas of development, and reduce the consequences of floods by restricting new development in known flood-prone areas. There have been only a few instances of retreat from flood-prone areas, and only one anticipatory one, achieved through multiple objectives defined by the community with the council responsible for the project and funding of it (Vandenbeld and MacDonald 2013). The specter of increasing frequency of extreme precipitation events as a consequence of global climate change (Reisinger et al. 2014), has stimulated New Zealand’s interest in what this might mean for the integrity of current flood protection measures. There is well-documented New Zealand-based research (Ericksen 1986) highlighting the role that structural protection has played in creating disasters, through a “safety paradox” based on the “levee effect” (Burby and French 1981; Burby et al. 2001; Tobin 1995). The ensuing damages, in event of the protection levels being exceeded, will be exacerbated by the impact of climate change on flood flows. With this background, the Greater Wellington Regional Council (GWRC) sought to understand the “effects of climate change” (as required under the Resource Management Act 1991 as amended in 2004) for the completion of the Hutt river protection scheme (one of the largest such schemes in New Zealand, funded by regional rates (property taxes) on communities) and for the surrounding development and its proposed intensification. The Council started by better understanding the nature of the changes in climate and their effects on flood flows, based on research at the New Zealand Climate Change Research Institute and Victoria University of Wellington (Lawrence et al. 2013b). This raised awareness by showing the effect of climate change on the current protection levels, and therefore when the scheme would fail to reach its objective of protecting the surrounding city (Hutt City) from a 1:440 year flood event. This protection level had been decided following extensive community engagement as the scheme was being reviewed (Wellington Regional Council 2001). While previously the Council had identified the need for complementary planning measures, such as rules for flood proofing new developments and identifying flood paths (Wellington Regional Council 1996), these were never fully implemented in land-use plans. This was in large part because the Regional Council had no planning rules in place in its Regional Plan that were required to be implemented by the district council (Hutt City) responsible for land-use planning; this was assumed to be the preserve of the city council. The protection level was perceived as a high level of protection and thus conveyed “safety.” This had the perverse effect of diminishing the need for planning rules to address the “residual risk,” should there be a breach or overtopping of the levee. Consequently, implementation of such measures has been limited to the floodway and some unprotected areas. Previous studies had identified the effect of climate change on flood risk (Pearson and McKerchar 1999; Tait et al. 2002), which was considered when setting the design standard for the Hutt River Flood Management Plan (HRFMP, Sect. 3.4, p. 36). However, climate change had not featured in long-term land-use development planning. Thus, the legacy of assets and people exposed to increasing flood frequency has persisted and increased. With an enabling environment setup and the expertise and facilitation in place, interest was first stimulated using presentations of the problem and tools used to address the problem at a generic level. The framing of the problem proved crucial in getting Council staff to understand the changing risk. This was demonstrated by their organizing several further staff workshops/meetings, and the ultimate inclusion of the theoretical DAPP approach into their final work on the Hutt River Flood Scheme. This occurred first with the technical advisory staff within the Council, then with the elected Council members at several workshops/meetings. Further awareness was raised by introducing the Sustainable Delta game [a serious game to experience and thus learn how to make decisions under deep uncertainty over long timeframes (Valkering et al. 2013; http://deltagame.deltares.nl)] to the Council staff. Their interest was stimulated to the extent that they helped fund further development of the game and its tailoring for New Zealand settings (visually, and the models/scenarios that drive it). The latter activity had two purposes: satisfying the demand from the Council, and enabling the University and Deltares to experiment with the use of the game, undertake refinements, and develop further modules for river and coastal settings. This subsequently catalyzed demand for the game and the associated pathways generator (for drawing alternative pathways and stress testing them against different scenarios of the future: http://pathways.deltares.nl) to be used elsewhere in New Zealand for national guidance on coastal hazards and climate change (Ministry for the Environment 2017), for strategy development (e.g., Hawkes Bay Clifton to Tangoio Coastal Hazards Strategy 21203), and for other planning purposes. Staff were trained by Deltares and the University-based facilitator to use the approach (DAPP) and the tools (the Sustainable Delta game). The steps undertaken to introduce and implement the approach are shown in Fig. 9.1 (the events above the timeline). In addition, relevant environmental, social, and political events are shown (below the timeline) that created a receptive space for use of the approach. These enabling conditions in the context (shown below the line in Fig. 9.1) included the growing number of national and international reports and hazard events signaling changing risk; the flood manager’s wish to increase the capability of the staff; the ability to do embedded action research; the opportunity provided by the interest of the Council; a trusted facilitator; an implementable theoretical approach; and support from the top of the Regional Council and by the functional managers (Lawrence and Haasnoot 2017). Within DAPP, an adaptive plan is conceptualized as a series of actions over time (pathways). The essence of the approach is the proactive planning for flexible adaptation over time in response to how the future actually unfolds. The approach starts from the premise that policies/decisions have a design life, and might fail as the operating conditions change or underlying assumptions turn out to be wrong (Kwadijk et al. 2010). A set of questions are asked that facilitate consideration of the risk over a long time frame and enable different strategies that can meet the long- and short-term objectives to be met under different scenarios of the future and consideration of their consequences: What are the first issues that we will face as a result of climate change? Under what conditions will current strategies become ineffective in meeting objectives, and thus reach a threshold?4 When should the various actions be triggered given that their implementation has a lead time?5 What are alternative policy pathways that can be taken? How robust are the pathways over a range of plausible future climate scenarios? Are we able to change paths easily and with little disruption and cost? The formulation of these questions, based on the triggering issues, are part of the first element of the generalized framework for dealing with deep uncertainty in decision making. The framework is described in more detail in Sect. 4.2 of Chap. 4. Hourly rainfall data (historical and adjusted for future climate changes in means and extremes) using a hydrological model (Topnet) to derive flood frequencies under both historical and the 48 alternative future climates. Subsequently, alternative sets of actions are proposed (which were called “options”). In this specific case, the options, alternative pathways, and thresholds were identified using iterative processes involving technical advisors, decision makers, and community stakeholders, as input to the decision-making process. Futures were generated on the basis of IPCC scenarios. The discussions produced three sets of actions to be studied in detail (which were labelled Option 1, Option 2C, and Option 4). The options were then tested against the scenarios and a pathways map was generated, as shown in Fig. 9.2. If an initial action fails to meet the stated objective, additional actions or other actions are needed, and a several pathways emerge. At predetermined thresholds, the course can change while still achieving the objectives. By exploring different pathways, and considering whether actions will lock in those actions and prevent adjustments in the future and thus create path dependency, an adaptive plan can be designed that includes initial actions and long-term options. Hutt River City Centre Upgrade Project: adaptation pathways map showing options, pathways, scenarios, and adaptation thresholds; scorecard showing relative costs and direct effects of pathways, and potential side effects requiring consideration. The pathways map resulted in a set of six feasible pathways. Figure 9.2 presents a scorecard that shows the effects of each of the pathways (both the direct effects and the side effects). Because we do not know the probabilities of different climate/flood damage scenarios but we do know the net cost of each pathway, we used a variation of Real Options Analysis to ascertain what occurrence probability threshold a particular climate/flood scenario would have to attain, that would justify choosing one pathway over another. 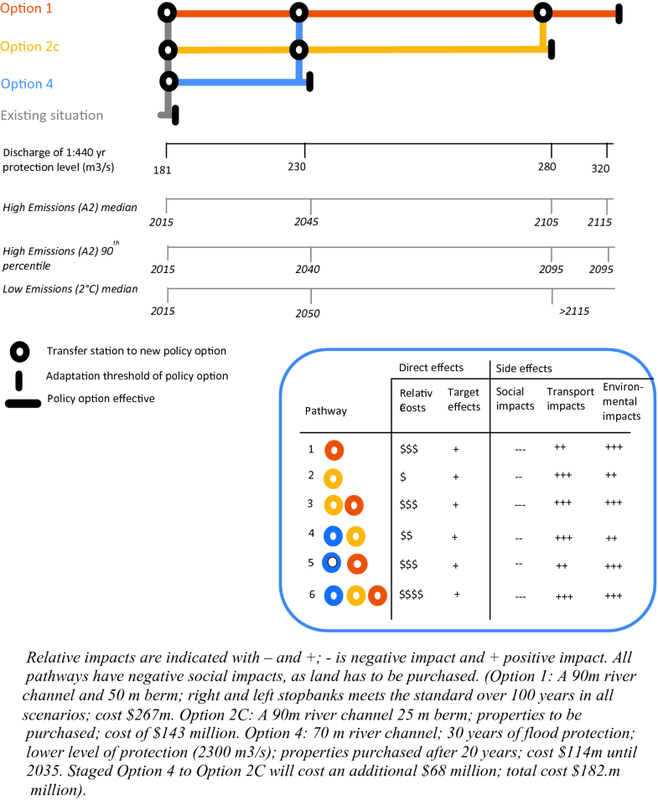 The net cost of each pathway was also tested for robustness to different assumptions about the discount rate, implementation costs, residual loss, decision review dates, and different climate/flood damage scenarios. The decision makers discussed the alternatives, and decided to consult the community on Options 2C and 4 prior to making their final decision on a preferred pathway. A brochure setting out the two alternative options was circulated within the community, and a survey of public perceptions and preferences for the alternatives was undertaken. The community’s preference was for Option 2C as the initial set of actions. The Council then agreed to Option 2C in its final decision, which was then communicated to the affected properties directly, through the local media, and via the Council’s online decisions record. The plan is being implemented and will be monitored using signals that indicate when the next step of the pathway should be triggered or whether reassessment of the plan is needed. The signals will be socially defined, reflecting the tolerability of the adverse consequences by the community, or at the 10-year review period for the Hutt River scheme, whichever comes earlier, before thresholds in the physical processes are reached. Staff capability increased by providing a tool that could motivate futures consideration in the analysis of options (the Sustainable Delta game) and that could motivate the use of ROA analysis alongside DAPP, which also increased the capability in the use of DMDU tools. The pathways in this case study were developed manually, and then redrawn using a pathways generator6 developed by Deltares. The theoretical pathways approach was embedded in the staff knowledge and operations of the flood group. This was demonstrated by requests to repeat the process in other catchments, which was subsequently done. The use of DMDU tools also brought together a wide range of local and central government officers and elected representatives, which enabled a multi-disciplinary environment to develop for problem-solving. Importantly, the Council reached a decision on which packages of initial actions (i.e., options) to discuss with the community. Two alternatives were chosen—one starting now and continuing quite far into the future (Option 2C), and a staged one that was more cost-effective in the short term, but would have to be changed fairly soon (Option 4). Option 1 was not consulted on, because the Council decided it was too expensive to implement now (although it was likely to be needed in the long term). The Council made the decision to begin by implementing Option 2C after receiving overwhelming support for it from the whole community. Cost-effectiveness is thus not necessarily the primary motivator of decisions in such contexts. The Council’s decision to commit to land purchase under Option 2C created a certainty of funding for those in the urban area affected by this option. While this was open for both options 2C and 4, property owners preferred near-term certainty over waiting 10 years for the land purchase to take place, when another Council might have different priorities. Thus, the certainty created was a stronger motivator for the decision taken, compared with the more cost-effective staged decision (Greater Wellington Regional Council 2015). This was supported by both directly affected property owners and the wider community. How far does DAPP take us in addressing uncertainty? This case study was in part experimental in the New Zealand context, providing an opportunity to identify where further theoretical and methodological development might take place. We found that for new approaches to be adopted, a “knowledge broker” was necessary to enable the transfer of new knowledge and to facilitate learning. The request to Victoria University of Wellington to assist in this regard, to improve the capability of technical staff at the Council to address “the effects of climate change,” is evidence of that. The Council was aware of the IPCC 2013 and 2014 reports and their statutory mandate to address the impacts of climate change. Using the University as a broker of new knowledge and practice through participation in workshops and conferences internationally opened up wider research networks to the councils, bringing in new understandings of the effects of climate change and new tools for practice. The DAPP approach was attractive to the Council because it deals with uncertainty by enabling a full range of plausible futures to be explored, and thus also addresses tail-end risk (surprise or “Black Swans”). The relationship between the Council and the University facilitator enabled the Council access to tools and techniques that otherwise were not readily accessible to them. Their focus was on solving problems on the ground within a political setting that requires certainty and progress on projects that deliver community services. It thus also had utility for the political decision maker who wanted a systematic, yet flexible tool, to assess changing risk profiles within their term of office (three years), while also achieving flood protection over the long term. Communities may prefer to pay more for certainty of outcome than a pure cost-effectiveness analysis might suggest, as evidenced in the Hutt River case study. Understanding such preferences will change the way the pathways are quantitatively assessed. It will affect how to weigh certainty against cost (the decision taken was more costly to the Council over time than the alternative). This factor needs to be understood better in terms of its effect on how the different actions and pathways are framed. The need to reframe the problem to increase understanding and implications of the uncertainties was recognized early on in the process. This recognition became catalytic in the uptake of DAPP within the work of the council flood group. In this context, leadership inside and at different levels in the organization contributed to its mainstreaming, as it did across the region in other cities (e.g., Wellington City Council). The political leadership of the joint councils flood committee, and its chair in particular, also contributed to the uptake of DAPP in flood management assessments and decision making. Funding support from the national government helped to get other councils involved in using the tools, and this is ongoing now through the Resilience and the Deep South National Science Challenges for theoretical and methodological developments, and through testing their application in other case study areas (e.g., the “Living at the Edge” researchers working with the Hawkes Bay joint councils developing the Clifton to Tangoio Coastal Hazard Strategy 2120). Applying the DAPP approach through serious game workshops across New Zealand has helped bring together a wide range of local and national government officers and elected representatives, enabling a multi-disciplinary environment for problem-solving. This particular case study was constrained by the boundary condition of a single river, which enabled a focused application of the theoretical approach. On the other hand, further applications will enhance learning about the method, if they are focused on wider regional strategies and multiple stressors, and are applied with communities that have a wider stake in the outcomes of the decision making process. Embedding DAPP within New Zealand’s national coastal hazards and climate change guidance (Lawrence et al. 2018), centered around community engagement processes, reinforces wider use of DAPP in decision making for other problems that involve deep uncertainty about the future. Further research is needed for implementing DAPP in spatial planning contexts that typically use static consideration of future risk within legal frameworks that emphasize “certainty.” Overcoming the certainty/change paradox is necessary to address the path dependency of current approaches for dealing with the future. The risk of path-dependent decisions and the role that current frameworks and practices play in blinding actors to the range of possible outcomes that could evolve in the future, was therefore reduced. In this case study, the adaptation thresholds and decision trigger values (trigger points) for deriving signals of change were not fully developed. The economic analysis of the pathways was undertaken as a sensitivity analysis of the factors noted in Sect. 9.4. Further work in the New Zealand context is underway to define trigger points for future thresholds for changing pathways. Some work has started on this (Barnett et al. 2014; Stephens et al. 2018; Werners et al. 2013), addressing physical impacts, socially defined triggers that are decision relevant and meaningful to the affected communities, and the relationship between the trigger points and decisions that can be taken, and when. However, whether signals and trigger points can be monitored and acted upon in practice is unclear in a river management context. This is because funding allocations by councils are made on a 10-year basis with three-yearly reviews [through statutory Long-Term Plans (LTPs)]. This funding system, with its focus on structural investments for “protecting” communities from floods, as opposed to reducing future risk, will affect how reviews at trigger points can be implemented. For example, it is never certain that funds will be allocated at any time in the future through the LTP, because of other competing projects, the priority for which will also be affected by future values, social and economic preferences, and vulnerabilities. The ability to implement pathway choices made today is influenced by the dominant political setting, governance arrangements, and economic conditions. Addressing the following questions is therefore critical for whether policy choices can be implemented: How can the planning approach, and the decisions made, persist? How can the planning objectives be revisited when the operating conditions and enablers change? Does the theoretical approach hold under “fire” from communities directly affected by the risk, and when “surprises” or disasters happen? Can DAPP facilitate the identification of enablers and entry points for a robust and flexible implementation pathway? 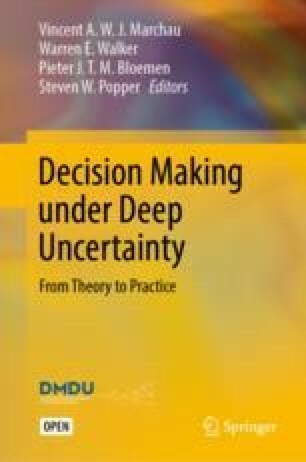 Better understanding of the influence of these questions and their answers on the planning and implementation process, and how to make their constraining characteristics into opportunities for adaptive decision making, will be essential for deep uncertainty to be addressed where it matters. It should be noted that by the time the IPCC review reports are published, the knowledge base can already be several years out of date, due to the cut off dates for peer review of the papers. The timeframe set out in the New Zealand Coastal Policy Statement, the Ministry for the Environment guidance documents, and the practice for flood risk management. What is called a ‘threshold’ in this chapter is called an ‘Adaptation Tipping Point (ATP)’ in Chap. 4 (DAPP theory). They mean the same thing (see also the Glossary). Since this case study predated the explicit identification of adaptation signals and trigger points (as described in Chap. 4), they are not mentioned further here, or shown on the pathways map, although consideration was given to lead times. The pathways generator can be found here: http://pathways.deltares.nl/.